Welcome to the Cara Mar! We've been renting our studio condo for over 35 successful years! Our guests tell us that our location is what keeps bringing them back all seasons! From our top 4th. floor oceanfront balcony you will hear the waves splashing on the shore, as you breathe in the salty air. You may even catch a glimpse of the dolphins splashing offshore. Parks, restaurants, shopping and public transportation are close. A studio condominium is perfect for up to 4 people. This is not a one bedroom condo. There is a full sized murphy bed and queen size sleep sofa. The murphy bed is located behind the ship wheel in the photos. Pillows and blankets are available. Because the condo is located on the top 4th. floor noises and other distractions are minimal. Beach access is phenomenal and just steps from the elevator. You do not need to cross any streets which makes lugging your beach equipment so much easier and safer. The parking lot is so close to the beach and building that you can pick beach equipment up from your car on your way to the beach. There is a boardwalk that extends to the dunes and provides direct access to the beach. An outside shower for Cara Mar guests is available. Free secured WiFi is available and the password is located within the condo. Our studio is recently updated with new carpeting, fresh paint, tiled floor, heat pump, AC unit, and hot water tank. The kitchen is fully equipped with pots, pans, dishes, microwave, dish-washer, large refrigerator, full-size cook top/oven, disposal and dining table for 4. The full-bathroom features a bathtub and shower with grab bar. Towels, toiletries and paper products are not provided. Relax by the private pool! A key will be provided to ensure your access. The elevator is brand-new and fully accessible. Laundry is also available on-premise and you will be provided with a key for access. The washers and dryers are coin-operated and located by the elevator on the ground level. There is an assigned free parking space close to the elevator and pool. We require weekly reservations during the on-season. If you are interested in a shorter stay off-season please get in touch with us! The building is a mid-size masonry condominium complex. Once you have booked a stay with us we will provide keys for the condo, laundry room, and pool, as well as a parking permit and any additional last-minute instructions. You can expect all this information through USPS-delivered mail. a 50% refund of the total cost if they cancel at least eight weeks before check-in. a 25% refund of the total cost if they cancel at least four weeks before check-in. The Cara Mar is located in North Ocean City at 123 St. and the ocean. It is in an area that has all of the beach amenities including Bus Service to the entire area. You can rent umbrellas and beach chairs right out front of our condo. We are near North Side Park, water sports, miniature golf and great restaurants. The environment is quiet and family oriented. Restaurants, shopping and parks are within walking distance. 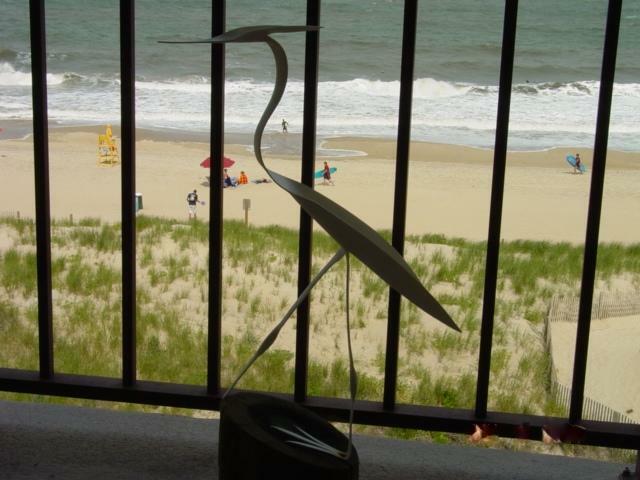 Enjoy tax-free shopping in nearby Rehobeth and Bethany Beach Delaware. Ocean City has a very robust bus network that operates extremely frequently during the season. It also operates during the off-season with fewer buses. There is a bus-stop directly across the street from our building. For just $3 you can ride the bus as much as you'd like all day long, perfect for heading down to the boardwalk and back. Google Maps and other navigation software should bring you right to the Cara Mar. Refer to the photos to see what the building looks like. Parking is directly in front of the building. We like a hands on approach to handling our rentals, so you will deal directly with us. We will mail you the parking permit and keys about 3 weeks before your due arrival date. When you return you will be mailing the keys back and we will then send the security deposit, upon inspection. Mother of 5. Grandmother of 16. Retired chiropractic assistant. I was raised near the water and always loved the beach. It's exciting I can share that experience with others on TripAdvisor. I've been renting out my ocean front condo for over 35 years. We picked a great week, it had been our 26th anniversary , got there Sunday nite late. Husband next day wen to Urgent Care, found that he had an pneumonia. So we really only had 4 days. But be as it may,it was just like home, wish we could of stayed longer. Peggy Era, she's wonderful! It's defiantly worth going back! My husband and I took some time to spend a long weekend together for our anniversary, we stayed at this oceanfront get away. We had a wonderful time. Watched the Dolphins, watch the sunrise, Sat on the beach, went to dinner and many other things. The place was perfect for us. We would stay here again in a heartbeat. There was only one problem. not enough time to do everything we wanted to do. We definitely hope to be back next summer. Same place same time. Highly recommend it. Owner's reply: Hello Doris: What an absolute delight to receive your unsolicited review. Charles and I are thrilled you chose us for your anniversary. We are looking forward to your return. Peg. Very nice clean room for the perfect getaway for a couple looking for a quiet vacation. The top floor allows for a great ocean front view of the beach and ocean. The owners are great and very helpful in accomadating our needs. I would recommend this for two people and maybe a child. It may be a little small for 2 adult couples. My wife and I had a great time. Well equipped, studio. Great ocean view & location. Also enjoyed the pool. Would recommend for couple or 3 people. Great little condo for a week at the beach! Great location with many shops and restraunts nearby. We had a wonderful time and hope to make it our yearly vacation destination. Excellent location n excellent place ! We loved it n had a blast ! Thx for helping me find something i could afford ! Owner's reply: Hi Tara: It is always awesome to receive feedback and we really, really, appreciate it. Thank you so very much. Sincerely, Peg. Owner's reply: Hi Steve: You are the best for taking the time to give such a nice review. It is great feed back as we strive to do our very best to make our guests comfortable. Peg. Owner's reply: Hi Ray: It was so nice having you and your family as our guests. We appreciate so much your review of our condo at the Cara Mar. It is our desire to help our families to have a peace filled vacation. We are looking forward to hearing from you again in the future. Thank you. Peg.